Host a “Nearly New” Coat Drive // Chances are community service agencies in your town can use “nearly new” coats this time of year. 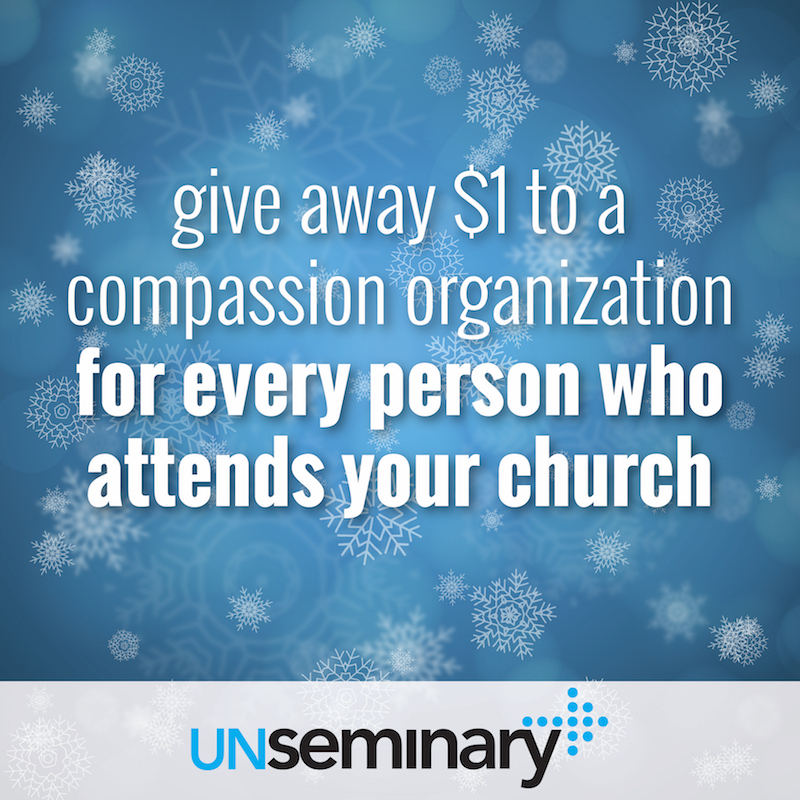 People in your church probably have an extra coat or two they could donate to a great cause. It’s an easy-to-execute win. Your local party rental place may rent out coat racks for your foyer, so when people bring coats to your services they are nicely displayed. Stress that the coats need to be “nearly new,” which means in great condition and something they’d be proud to pass along to a friend. BONUS: Poke around Amazon to find some great deals on coats to get the giving started! “1 for 1” Offering // Inspired by what Rock City Church does every Sunday, pick a weekend and pledge to give away $1 to a compassion organization for every person who attends your church. If 462 people come to your Christmas Eve services, cut a check for $462 to the local Salvation Army towards their Christmas Campaign. 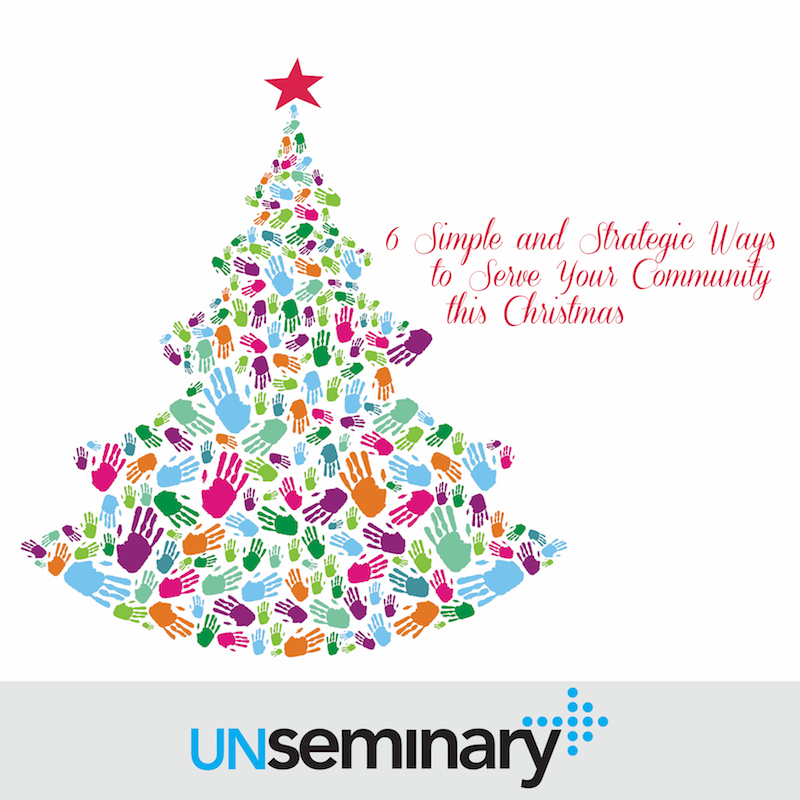 Most churches are already giving benevolence or compassion support to these organizations at this time of year. This is a great way to highlight their work and to reinforce to your people that good things happen when they attend and give to your church! “Fill the Truck” Food Drive // A new spin on a classic way to serve your community: find an interesting vehicle and challenge people to fill it with non-perishable food. Is someone at your church part of a construction company? Ask him or her to bring a front-end loader one Sunday and challenge people to overflow the bucket. Or perhaps you know someone from the local ambulance who could get access to an off-duty rig. Fill it and make a delivery to the local food bank. It’s a fun way to engage people in helping others, plus it’s great to have the items already in some sort of vehicle to take them to your partner! Christmas Toy Tree // Connect with a local community service organization and ask if they have families who need help with gifts this Christmas. Make a list of what they are looking for and write each item onto paper tags to hang on a tree (or two) in your foyer. Encourage people to take tags and purchase the gifts. They bring back the unwrapped gifts with the tags attached. The community service agency can drop by and pick up the gifts already sorted with information on each gift describing whom it is for. Ask Your Neighbors // I love what Evangel Church did when they gave up their weekend service to do community service. You could replicate a version of this by gathering a group of volunteers to go to any businesses close by as well as homes that are adjacent to your facility. 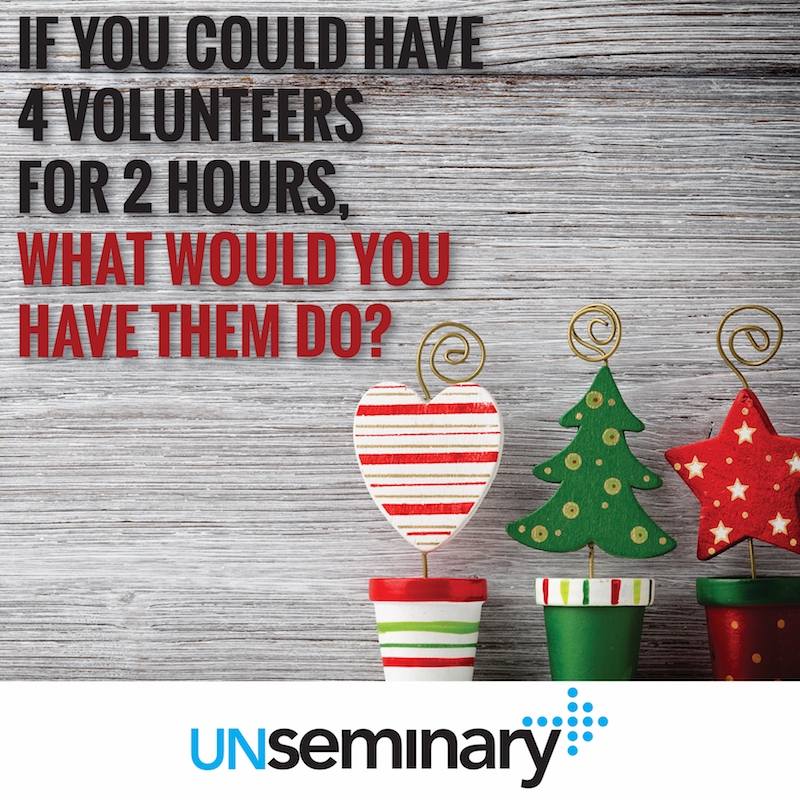 Have them ask, “If we could send 4 volunteers here for 2 hours, what would you have them do?” Write down what they’d like done and then put those “tasks” on tags on a Christmas tree in your foyer. Ask people to pick a task or two off the tree and get the task done by a certain date. Explain that the tasks require 4 people and a couple hours to complete … also give them guidance on interacting with your neighbors. Ask small groups to “adopt an emergency room” and take coffee and light snacks at different days over the Christmas break. Deliver baskets to teachers on the last day of school with a big thank-you card from the people at your church. Take baked goods to the local police station on Christmas Eve.